Every few years a new documentary comes along that so powerfully resonates both emotionally and intellectually that it can truly be deemed unforgettable. My Louisiana Love is such a film. This profoundly poignant exploration of environmental injustice and loss focuses a revelatory light on an otherwise invisible American tragedy. My Louisiana Love follows a young Native American woman, Monique Verdin, as she returns to Southeast Louisiana to reunite with her Houma Indian family. Soon, however, she recognizes that her people’s traditional way of life – fishing, trapping, and hunting the fragile Mississippi Delta wetlands – is threatened by an unceasing cycle of man-made environmental crises. As Louisiana is devastated by hurricanes Katrina and Rita and then the massive BP oil leak, Monique finds herself increasingly turning to environmental activism. She documents her family´s struggle to stay close to the land despite the cycle of disasters and the rapidly disappearing coastline. 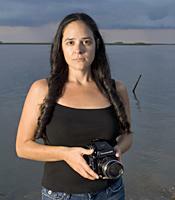 Accompanying Monique, the film examines the complex and unequal relationship between the oil industry and the Delta’s indigenous Native American community, revealing in the process how the political and economic policies dictated by the oil industry are wreaking havoc to the Delta environment and the survival of the local indigenous culture. But My Louisiana Love does not derive its power just from the social issues it so clearly examines. Echoing the larger social picture around her, Monique herself must overcome tremendous loss: the destruction of her family home, the death of her father, and the suicide of her partner. By following her calling as a storyteller, Monique draws strength from deep relationships and traditions and redefines the meaning of home. She perseveres and becomes a resilient voice for her unrecognized people. My Louisiana Love is at once a riveting social documentary and an intimate portrait of a complex and memorable individual. Although it is suffused with an almost elegiac poignancy and sense of loss, the film is ultimately an inspiring profile in courage, community, and commitment. This tension is what gives the film its overwhelming impact. My Louisiana Love will motivate student thought and discussion and be an indispensable teaching tool in a wide array of classes in Native American studies, American studies, sociology and social issues, the environment, cultural anthropology, and women’s studies. It was produced by Sharon Linezo Hong, Julie Mallozi, and Monique Michelle Verdin, and directed by Sharon Linezo Hong. The DVD is fully authored by the filmmaker and includes closed captioning and both Spanish and French optional subtitles.